The first thing we need to establish is the understanding of what an infrared body treatment is and what it supposed to do. When we accumulate body fat tissue, most commonly in men, it is from the waist upward. In women, it is from the waist down. When we accumulate body fat anywhere in the body, blood circulation becomes worse. As we accumulate more and more body fat, our circulation decreases even more. Because of a lack of blood circulation, we cannot metabolize or burn the excess body fat. In addition, very little heat is being circulated to that part of your body. This result is what we call "cold spots." When we take away the heat from that area of your body and it cools, the fat then turns from subcutaneous fat into cellulite. Subcutaneous fat is very soft and easy to lose. Cellulite is almost like hard muscle that is hardened from the lack of blood circulation. The purpose of the infrared body treatment is to apply heat to the body in order to get underneath the fat tissue and thin the blood to allow it to get into the areas where fat tissue exists. Bringing the blood back into the areas that have had restricted blood flow causes the metabolism rates to rise. The heat softens the fat tissue and it begins to break up causing it to be released back into the blood stream in the form of calories to be burned up as energy. The body accumulates fat by a simple biological process. The food we eat contains calories that are stored in our blood stream. When we have an excess of calories, the body stores them as fat. The Infrared Body Treatment reverses this process by breaking the fat down into calories and placing them back into the blood stream to be used as energy. To reiterate, the purpose of the infrared body treatment is to get heat into the body, thin the blood, bring metabolism back into the "cold spots" and melt the fat tissue down. Like heating butter in a frying pan, it liquefies the fat, converts it to calories and puts it back into the blood stream so your body can convert it into energy. Understand that the argument against other methods of wrapping does not claim that they do not work. The claim is that they are not as effective. Following is another example of how other treatments are not as effective. A sauna warms the body from the outside in, which makes the body release sweat within minutes. The body's natural function is to keep cool causing the body to merely perspire. Therefore, any temporary reduction in weight is generally from water that has been perspired. The Infrared Body Treatment, as opposed to the above methods, uses infrared heat. Through the many years of its use, infrared has come to be known as a treatment with many benefits. It has been used in hospitals, chiropractic centers, and is used by sports therapists. The great thing about infrared heat is that it is able to penetrate the body and go directly to the bone. This is why the Infrared Body Treatment is sometimes used for sports injuries. When you damage a muscle, the heat goes right to the bone and promotes blood circulation which helps alleviate the pain. In addition, pain such as arthritis is relieved. The Infrared Body Treatment does not warm the body from the outside in; it warms from the inside out. With infrared heat, it is known that it takes approximately 20 minutes for the heat to penetrate the skin and upper layers and reach the bone. During the remaining 30 minutes of the Infrared body treatment session, the heat rises and gets underneath the fat cells, including cellulite. It is now heating the body, including the ligaments and the joints as it begins breaking down the body fat and releasing the fat stores and toxins into the blood stream and sweat glands for removal from your body. This is a process that has worked for 25 years and cannot in any way be abbreviated. A few of our Clients have asked if they could have a shorter session time as they are rushed or on some days, in a hurry. To do so would substantially eliminate any benefits to be derived from the entire process. It would leave the fat stores and the toxin removal process in midstream. And the effect would be that the fat and toxins you are targeting would remain in the system until such time that a full 50-minute session could be implemented. The temperature of the infrared body treatment remains constant from the first minute to the very last minute. This increases your metabolism for 50 minutes, which is what melts the fat away. The blood is thinned with the heat and it comes back in the areas of the fat tissue. It jumpstarts metabolism, which breaks down the body fat and releases it back into the bloodstream for the body to use up as energy. Losing Weight is quite simple... you simply need to burn more calories that you consume. Unused calories are stored as fat. Fat storage areas on women are primarily the thighs, buttocks, stomach, breasts and upper arms. Stored fat is known, as "cold fat" as blood circulation is extremely low in fat storage areas. When we work out, our muscles and vital organs get the majority of our blood flow. It is virtually impossible to "work off" fat thru exercise. Limited blood circulation results in what is known as 'cold spots' where the fat hardens and over time leads to cellulite. The Infrared Body Treatment reverses this situation by applying infrared heat to the body. Infrared rays gently heat the body from the inside out to get underneath the fat tissue. Blood flow is increased over 300% in the 'cold spots' where fat tissue resides. Bringing blood back into the areas that have restricted blood flow causes the metabolism rate to rise. Infrared heat softens the fat/cellulite tissue, breaks it up, and releases it back to the blood stream to be burned up as energy. You can burn up to 900 to 1400 calories or more in just one 50-minute session. Your body will burn off those calories through the day. The best of all is that the inch loss from infrared is permanent. During a session of the Infrared Body Treatment, the body works to cool itself, there is an increase in heart rate, cardiac output and metabolic rate. Blood flow during whole-body hypothermia is reported to rise from a normal 5 to 7 quarts per minute to as much as 13 quarts per minute. This benefit was recognized in the prestigious Journal of the American Medical Association as long ago as August 1981: "Most of us who run do so to place a demand on our cardiovascular system, not to build big leg muscles. Regular use of infrared heat therapy imparts a similar stress on the cardio- vascular system, and its regular use may be as effective a means of cardiovascular conditioning and burning of calories as regular exercise." Perhaps the most immediate relief your session on an Infrared Body Treatment offers is simple relaxation, as it melts away the stresses and tensions of urban life. Just a few minutes in the gentle warmth of the infrared heat gives you an overall feeling of well being, soothing jangled nerves and knotted muscles. You'll feel rejuvenated and renewed, restored in both body and mind. As the world in which we live becomes increasingly stressful both physically and emotionally we are left with two choices; either we avoid stress, or we learn how to deal with it effectively. It is, of course, impossible to avoid stress, and therefore the only real solution is to find ways to manage the stresses that we encounter each day. One way is the use of full body infrared heat treatments as offered by Perfect Tan, Body & Wellness Center located in Orem, Utah. Infrared heat is a necessary form of energy that all living things require for optimum health. If we don't receive enough far infrared light from the sun, we become ill and depressed. All life forms on this planet; animals, plants and humans, need this abundant far infrared light to be completely tranquil, calm, and healthy. The radiant heat from far infrared surrounds us and penetrates deeply into our joints, muscles and tissues, speeding oxygen flow and increasing circulation. Far infrared therapy helps to purify our cells, specifically the cells inside our fat where our body stores waste and harmful toxins, such as cholesterol and heavy metals. When used properly, this healing technology has zero side effects. Infrared energy effectively breaks down water molecules that accumulate and store unwanted toxins in our body that block blood circulation and impair cellular functions. Exposure to Infrared waves steadily circulates blood, removing blockages in the blood vessels and allowing for proper oxygen distribution to all parts of the body. This action has had success in treating skin disorders such as acne, eczema and psoriasis. In a study performed by American researchers, the sweat of people using a conventional sauna was found to be 95 to 97% water while the sweat of those using a Far infrared heat system was 80 to 85% water with the non-water portion principally cholesterol, fat-soluble toxins, toxic heavy metals (such as mercury and aluminum), sulfuric acid, sodium, ammonia and uric acid. The unusually high concentration of heavy metals and other fat-soluble toxins is not found in the sweat from normal exercise the comforting heat from the infrared body wrap increases skin temperature, causing fats and oils to "melt" and seep out of the skin's sweat glands. As sweat and oil are secreted, the toxins dissolved in them are secreted as well. By excreting these toxins and then washing them off your body, your toxic load is lowered and cellular health improves. A: The customer is treated for 50 minutes, with around 10-15 minutes machine warm-up, client set-up and unwrap time. Please plan on about 60 to 65 minutes. A: With the 6 high-density silicone bandages, there are several options available. For most women the bandages are wrapped around the thighs, hips, abdomen, and arms. For men, the usual configuration is thighs, abdomen, chest, and arms. If the arms don't need much toning up, the calves can be wrapped instead. The heat to each of the 6 bandages is individually controlled therefore the level can be set according to the customer's comfort level or if a particular area is being targeted. A: The answer greatly depends on the physiological make-up of each individual. Generally, the greater the excess weight being carried, the faster and more dramatic the reshaping results will be. Some people will not experience significant weight loss at all but will see improved body shaping, losing inches or dress sizes. Extremely physically fit people that don't carry excess weight or inches can experience much improved muscle tone and body sculpting. Obviously, the more physically active a person is, the greater the benefits that can be achieved from Infrared Treatments. Common sense dictates that if a client is on an Infrared Body Treatment program and then eats or drinks excessively most of the results will be negated. Ideally, Infrared treatment will be of most value with a balanced exercise and eating program. Clients that lead a very sedentary lifestyle can still achieve great results over a longer period assuming that they exercise adequate control over dietary and other general health factors. Experience worldwide indicates that the rule of thumb is one clothes size reduction in 6 sessions with 2 to 3 days between each session. However, as previously indicated, results will be dependent on each persons particular make up and physiology. Q: How & Why Does Infrared Body Treatments Work? A: Far infrared energy (FIR) is a part of the natural light spectrum minus the UV element. The Infrared Body Treatment has been designed to output energy in the 5.6 to 25 micron FIR band also peaking around the 9.4-micron level to achieve maximum effectiveness. When FIR energy penetrates through the skin it transforms from light energy to heat energy and elevates the temperature of the subcutaneous layers. The body's absorption of this energy simulates a workout, burning up to 900 to 1400 calories in a 50-minute session providing body shaping and detoxification. Q: How often can clients repeat Infrared Treatments? A: This will depend on a person's lifestyle. If a person is very physically active undertaking significant walking, jogging, working out, or competitive sports, then Infrared body treatments can be as often as every 2 days. For best results it is preferable right before a workout as this will help burn the most dramatic amount of calories and also has maximum impact on body definition. With relatively physically inactive people, a minimum of 3 days between sessions is recommended. More regular sessions are unnecessary and may actually be detrimental to results. Upon reaching the intended body shape, it is possible to revert to maintenance only schedule, which for most people, should be around 2 to 4 times a month. Q: Can clients use multiple infrared treatments and a tanning session, on the same day? A: Both the Infrared Treatment and a tanning bed give off infrared heat therefore it is possible to receive a burn or heat rash if both sessions are undertaken on the same day. It is not recommended, especially if the client is fair skinned and prone to burning. Tanning the previous or the next day should be perfectly fine. A: Of course any diet and lifestyle improvement will be of benefit whether or not people decide to undertake an Infrared body treatment program. However, if a client has made the commitment to the Infrared body treatment program then more value will be derived from that commitment if other lifestyle improvements are also undertaken. Infrared is the band of light we perceive as heat. We cannot see this band of light with the naked eye, but we can feel this type of light in the form of heat. Our sun produces most of its energy output in the infrared segment of the spectrum. Infrared rays heat your body without having to heat the air in-between, through a process called conversion. The infrared is divided into 3 segments by wavelengths, measured in microns; 0.76~1.5 microns-near; 1.5~5.6 microns-middle; 5.6~1000 microns-far infrared. Among these segments, only far infrared penetrates organic substances such as the human body two to three inches so that the warming effect is very uniform. "After 60 my body's changes were unstoppable. My goal was to tone my body. The results of my infrared body wraps were almost instant. Although I noticed a difference after a couple of days, my family noticed after just two wrap sessions". H.S.R. I wasn't really sure about doing an infrared body treatment; I thought it was just something that I did not believe would work. But then after I heard from others who had used it, I thought I would give it a try for myself. WOW! I was amazed at the difference in how I felt afterwards and the energy that I had. Not counting the inches and pounds that I lost after doing three wrap sessions. Everywhere I went people would comment on how good I looked. The wrap really worked for me. Thanks for making me look and feel so good. Reggie D.
1- Drink plenty of fluids the Day before, Day of and Day after your treatment! a. You will be heated and sweating so we want to replenish your body fluids. b. You will be breaking up toxins and we need to flush them out. c. The Institute of Medicine advises that men consume roughly 3.0 liters (about 13 cups) of total water a day and women consume 2.2 liters (about 9 cups) of total water a day. Take your weight, divided by two equals the amount of once water per day. Example: If you weight 120 lbs divided by two equals at least 60 oz of water intake per day..
2- Drinking Hot none Herbal Tea before your session is wonderful as it warms the core temperature of your body plus increases your metabolism. This will give you a great jump-start to your session, as the treatment will do that same thing by increasing your core temperature and metabolism level. You will notice even better results by doing this before each treatment. 3- Don't eat anything heavy before your session. A light meal or snack is fine. a. We want the infrared to attract to its targeted areas, not what's in your stomach. 4- Wear the clothing you intend to be treated in. Cotton, or cotton blend sweats, extra long shorts or pajama pants. Medical Scrubs work well too. Anything light and that will cover to at least to the top of your knees. a. Cotton breathes best with the heat. b. If you are treating your upper arms, a ¾ or long sleeve cotton T-shirt is preferred. c. If you wish to manage upper back pain (between shoulder and neck) a tank or short sleeve shirt is fine. d. Bring an extra change of clothing if like that you can change into after your treatment session. You may be wet from the sweat and will not want to drive home this way. 5- Remove all metal piercing, metal necklaces and Jewelry. (Rings are ok) Also don't wear a Wired Support Bra. You will be heated with the Infrared heat, and metal added to heat do not mix well! Please have all metal removed before arriving for your appointment. 6- Feel free to bring in a DVD movie to watch. You treatment will last 50 full minutes and you will want something to do. We will offer Satellite TV also for your enjoyment. Bring a book, your I-Pod or just take nap if you can. This is a time to just relax as the Infrared does its work. 7- You are welcome to have one guest sit in the room with you during your session. We only allow one person and it cannot be a child under the age of 10. A member of our staff will be directing your treatment and will be in and out a few times during your session to check on your progress and to make sure you have water to drink and are comfortable. 8- You will also be able to contact a staff member by in room intercom if you have any problems during your session. 9- Plan ahead for your next treatment. Best results come when you do the treatments with 48 to 72 hours of your sessions. If you wait too long then your results will not be what you expected. Like with anything, this is a process and must be repeated. You will notice good results after your first treatment but just think of how great they will be after your third or forth treatments! 10- Because the session is a full hour process you must give us at least a 12 hour notice of canceling your appointment or changing it. We will need to book someone else into your time, if notice is not given we will then charge you for one lost session at regular price. .
Keep yourself hydrated with lots of water. You are now burning a ton of fat cells (or calories) through your blood stream as energy. Follow our water rule of at least 1-once of water per half your body weight. If you weigh 120 lbs then drink at least 60 oz of water per day or more. Gatorade, Powerade's are also good to drink as a replacement for water if you desire. You will notice that you feel totally drained of energy from your first visit. You have just burned off 1,200 to 1,400 calories and this is like running a 3-hour marathon! We suggest that you do not work out at the gym but do normal activities for the rest of the day. Ideally it is best not to work out the day of the Infrared Body Treatment. We suggest you do your treatment one day, then workout at the gym and tan the next day, then repeat this process going forward. You cannot use the Infrared and Tan on the same day. Your metabolism will be running high for the next 48 hours. This will be at a rate that you have not experienced in awhile. After 48 hours it will start to drop off, this is why we suggest you repeat the Infrared treatment every 48 to 72 hours. We want to build your metabolism level and you will notice inch loss and tightening of the skin as we do so. You may notice a loss in appetite as your system burns up the fat and calories that we just melted away using the Infrared treatment. If you are on a diet we suggest you stay on course with the same routine you have been following. Do not go out and overeat on a large meal. You will be tempted as you know you have just burned off a ton of body fat and calories but this will just work against the Infrared Treatment you just did. Sure, you won't gain on weight but you won't loose the inches or body fat that were just melted off. If you suffer from Insomnia the Infrared Body Treatment is an added bonus. We suggest that you do your session in the late afternoon or evening. You will enjoy a restful nights sleep and your body will adjust and you will sleep better then ever as you continue with your treatments. Don't look at the scale, just look at your bodies problem areas or measure them with a tape measure and you will see the results taking affect. The weight will come off if you are overweight, but you will notice inches first along with a reduction of percent of body fat. You will be building muscle tone. If you dare to take pictures do so from your first visit and track your progress. There will be a noticeable difference in Cellulite reduction as your skin smoothes out and tightens up. You will notice that your daily stress level will go way down. You will feel more relaxed and happy. Your skin will rejuvenate as the body detoxification takes over. These are just a few of the many changes you will notice that start taking place. The Infrared Body Treatment is a process. You will notice small results from your 1st Treatment, then better results within your 3rd treatment, then even Amazing results as you get into 8 to 12 treatments. 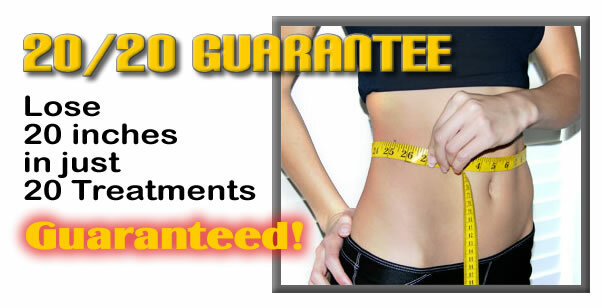 The desired body results for most clients will come after 10 to 12 treatments within the first Month. At this point you just want to be on a maintenance plan of doing 2 to 4 treatments per month to maintain your Perfect Body. Some clients will have to do 2 months worth of treatments if they are a bit out of shape or overweight. Your treatment will work even better by applying our formulated Infrared Body Gel before each session starts. Ask your Salon Attendant for more details of how it works. Your treatments should be done within 48 to 72 hours of each other. This means no long periods between treatments. If you are planning on a long vacation we would suggest you wait until you return to start your treatments. We need 30 days straight so you can achieve the full benefits of your treatment without any interruptions. Then its just maintenance a few times per month from that point forward. "We are pleased to offer our NEW breakthrough anti-cellulite, firming product. Have the smoother, more sculpted look you want with this amazing treatment. This is not just another anti-cellulite (body contouring) gel... This treatment is for the bust, belly, behind, and beyond.... Treat yourself and get the smooth curves you deserve." *Aloe: Cooling, soothing and moisturizing to the skin. *Vitamin E: Moisturizing; aids in reducing the appearance of scars and stretch marks. Streamlines the skin's appearance, so it looks more toned. *Alpha Lipoic Acid: Properties with anti-inflammatory and anti-aging agents that protects the skin from free radicals and environmental damage. Continued use improves the appearance of cellulite and can help fade the appearance of blotchiness. *CoQ10: When used regularly helps to improve the appearance of the skin's firmness, elasticity, tone, texture, and smoothness. It also helps to improve the skin's ability to retain moisture. *Grape Seed Acid/Extract: This powerful ingredient helps reduce the appearance of cellulite; it helps optimize the natural flow of "trapped" fluid for a more contoured appearance. *Green Tea Extract: This natural ingredient increases the metabolism, breakdown of fat, and reduces the appearance of cellulite. The release of caffeine from the Green Tea Extract helps to whittle away the appearance of wiggly waists and pudgy tummies. This is the morning cup of coffee, the "jump start" for the skin. This ingredient helps nourish and energize the skin. This technology helps increase microcirculation to attack cellulite prone areas and reduce the appearance of cellulite. This highly concentrated treatment firms and tones the body's contour while s2moothing dimpled skin. This gel is used to accelerate and maximize the benefits of the Infrared Body Treatment. Use the gel as an after care (second step) to moisturize, tone, detoxify and smooth the skin. Great for tightening your legs and smoothing your body before stepping out on the town! You will notice Amazing results from using this product during your Infrared Body Treatment as well as at home. Tell Your Friends! *All Treatment packages can be shared with one other person. *All Treatments expire from one year of purchase date. *The larger the package price the more you save overall per treatment. *We suggest that you do at least 10 to 12 treatments your first 30-Days, then maintain your desired results with just 2 to 4 treatments per month after that.